Often your projects is created with default references, some of which you will never use. Sometime you add a reference but then end up not using it. Over time you may have over a dozen references in each of a dozen projects and you know you are not using half of them. I know two tools that will resolve this. One if free and is a plugin only for this feature. The other is a commercial product and has hundred of features. I prefer the free tool by far as it is a simple and easy to use Visual Studio plugin. So I will test it first. Click the link and it download and installs in seconds. 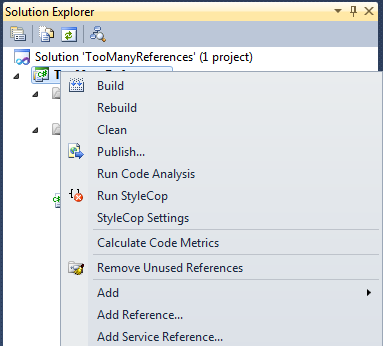 Then you will see the feature when you right-click on a project in Visual Studio. Click it and it will remove any references that are not actually being used. Ok, now lets create a sample project and see if this will work. Now lets right-click on the project and choose Remove Unused References. Unfortunately, my expectation were not met. Note: Remember TooManyReferences is the name of my sample project and that is actually confusing in the log. This tool removes references it should not remove. If you use this tool, try using it on one project at a time in a large solution, otherwise you could get overwhelmed with failures. It is pretty easy to add back references, so it is usable, but if it could be taken one step further, to resolve the references needed by objects my code uses, then it would probably be the best and simplest tool out there for this. 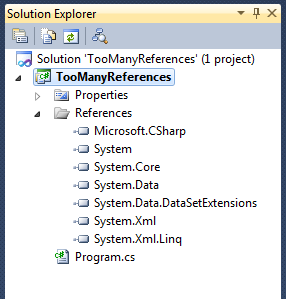 Resharper is the commercial tool that solves this problem. Unfortunately it is not free. However, it works well and I don’t currently have a license, but remember that it did not remove needed references when I last used it. Here is a link for more information. Adding Annotations to Flow Documents 04 min 35 sec ?? How to Use Isolated Storage 10 min 38 sec ?? Ink Basics in WPF 09 min 53 sec ?? Use PathGeometries in WPF 20 min 32 sec ?? Building a Client Profile Deployment for photoSuru 09 min 53 sec ?? The videos aren’t necessarily in order. There is not defined method to track your learning progress as you watch them. You can now track you progress as you self-train and go through the Expression 4 training videos. Well, once you have gone through all these videos you can probably call yourself trained in Application Design using Expression Studio, SilverLight and WPF. With these skills expect to make between 40k (0-1 years experience) and 80k (5+ years experience). How to create a copy of a control’s default style? Sometimes you need to make some advanced styling changes to a default control, such as a RadioButton, ListBox, DataGrid, Button, etc. However, you may want to keep the majority of the default style the way it is. In Expression Blend, this is easy to do. If you don’t have Expression Blend and you are developing in WPF, get it immediately. There is a trial version you can test out. Here is how to get your copy of any control’s default style. Add the default control to your MainWindow.xaml. Right-click on the control and choose Edit Template | Edit a Copy. On the Create Style Resource page, click the “New…” button near the bottom right, just to the right of the Resource dictionary option. In the New Item window, provide a name that is meaningfule. Click OK to create the file and to return the Create Style Resource page. Make sure Resource dictionary is selected (it should be) and click OK.
You have now created a copy of the default style of the control. You now have power to manipulate the control in advanced ways. It makes a difference if you do something the right way from the beginning. Everything seems to work out so much better and takes less time over all. Here are some basic steps that I have learned will help you do it right the first time. These steps are from my experience, mostly because I did it wrong the first few times. These are not exact steps. They are subject to change and improve. In fact, you might have improvements to suggest immediately when you read this. But if you are new to WPF, then reading these steps before you start and following them, will have you closer it doing it the right way the first time. It is much more pleasant to tweak a pretty good process than it is to go in with no idea for a process and do it wrong. Determine the minimal features for release 1. Determine the minimal features for release 2. Alter minimal features for release 1 if it makes sense to do so. Determine the minimal features for release 3. Alter minimal features for release 1 and 2 if it makes sense to do so. Apply the “Keep it simple” idea to the business logic and makes changes as necessary. Apply the “Keep it secure” idea to the business logic and makes changes as necessary. Repeats steps 2 and 3 if necessary. Backend development can start now as the UI and the back end should not need to know about each other. Determine what development model should be used to separate the UI from the business logic. Model-View-ViewModel (MVVM) is the model I recommend for WPF. Consider using a 3rd party WPF control set will be used. Many 3rd party companies provide WPF controls that are better and easier to use than those included by default. If you decided to use 3rd party controls, purchase or otherwise obtain the libraries for these 3rd party controls. Consider designing two WPF interfaces or skins (I will call these Views from here on out) for each screen. This will help drive the separation of the back end code from the WPF code. Also if developing two Views is not simple, it indicates a poor design. SketchFlow allows you to design the UI, which is commonly done in paint, but instead does this in XAML, and is actually the WPF code your application will use. SketchFlow allows you to deliver the design (or both Views if you did two) as a package to the customer. Deliver it immediately and get feedback. Make changes suggested by the customer if in scope. Take time to make the XAML in SketchFlow production ready. Deliver the XAML to the customer again, to buy of that the design changes are proper. Determine when to develop the delivery method. The easier the application is, the longer you can wait to determine the installer or delivery method. The more complex the install or delivery method, the sooner this should be started. Develop the application designed in step 2. Get the application working without UI or silently. Note: Start the next step, Develop the UI, as soon as enough code is available here. Start the UI project by copying the XAML from the SketchFlow document to your Visual Studio or Expression Blend project. Create a project for the ViewModel code and develop it to interact with the model and business logic using Binding. Remember to develop two Views for every UI screen as this will help, though not guarantee, that the the MVVM model was correctly used. Macintosh owns a significant market share. Determine if this application needs to run on Macintosh as well. Sure, since we are running C# your options are limited to either rewriting in objective C and Coca, or using Mono with a MonoMac UI. I recommend the latter. Note: It is critical that the UI and business logic are separated to really make this successful. Completely ignore the WPF design and have Macintosh users users assist the design team in designing the new UI. Macintosh’s have a different feel, and trying to convert the same UI is a mistake. Create the MonoMac UI project. Create a project similar to the ViewModel project in Windows, to link the UI to the business logic. BLU (BSD/Linux/Unix) doesn’t exactly own a significant market share. However, it is still important to determine if this application needs to run on on BLU as well. Sure, since we are running C# your options are limited to either rewriting in C++, or using Mono with a GTK# or Forms UI. Completely ignore the WPF and Macintosh designs and have Linux users assist the design team in designing the new UI. Linux has a different feel, and trying to convert the same UI could be a mistake. GTK# doesn’t support binding, but still keep the UI separate from the business logic as much as possible. Again, you may need to do this way sooner if the application is complex. Develop the install or delivery method. If you decided to deploy to Macintosh or BLU you may have to develop separate install or delivery methods for those platforms as well. Once finished, deliver this product. If you decided to create a Macintosh or BLU version, deliver them when ready as well. It is OK and maybe preferred to deliver these at different times.